The EU’s emissions trading system (ETS) covers almost half of the EU’s total greenhouse gas emissions and has been hailed as the cornerstone and flagship of EU climate policy. The ability to agree internally on the development of this flagship is essential to achieving the Union’s decarbonization ambitions. But in spring 2013 the ETS was in severe crisis, with a huge surplus of allowances and a sagging carbon price. Even a formally simple measure for changing the timing of auctioning was rejected by the European Parliament. And yet, only two years later, a far more fundamental Market Stability Reserve measure was adopted, and proposals for a complete ETS overhaul were put forward. How was it possible to turn the flagship around so quickly? 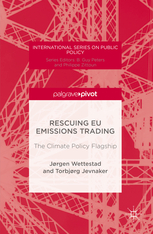 This book draws on close study of background documents, complemented by fresh interviews, to tell the fascinating story of how the EU’s climate flagship was significantly improved. Crucial changes at EU and national levels are identified, chief among them in Germany and the European Parliament.